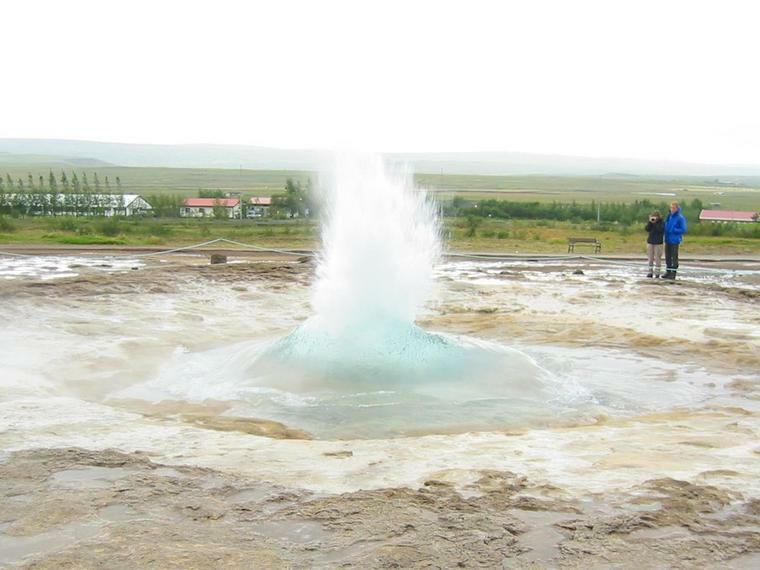 The hotel in Geysir was full - a geophysics conference was being held there - and they suggested we'd have to drive ten kilometres to Brattholt. But the guesthouse just next door was still operating and nearly empty, and 4700 króna got us a room with bedding. As soon as we'd settled in we went to check out the geothermal area just over the road. 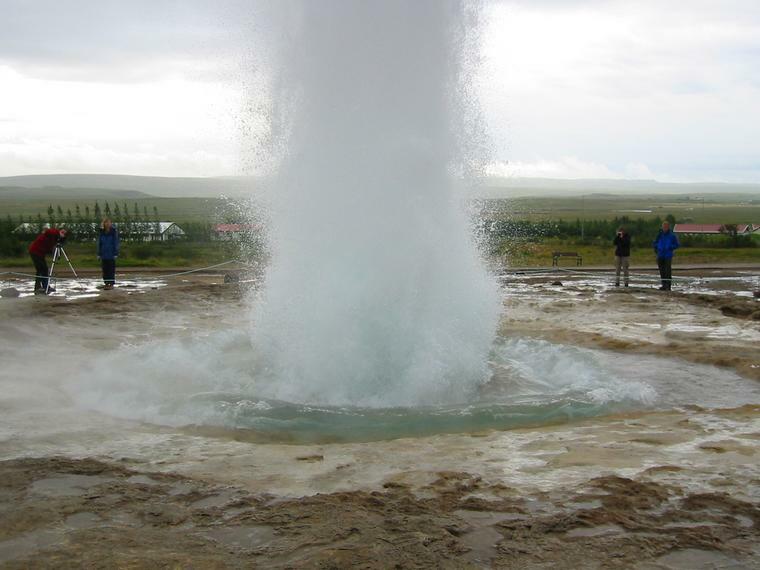 The eponymous Geysir is now dormant, but Strokkur next door goes off every eight or ten minutes, shooting up over twenty metres. It was raining and we got rather damp, as did Camilla's poor camera (though it came to no harm). Dinner was a cup of soup, cheese and ryvita, and spaghetti with baked beans, bolognese sauce, and some dried fish. Afterwards we went for another look at Strokkur and got wet again. Our room was full of damp clothing and equipment laid out to dry. 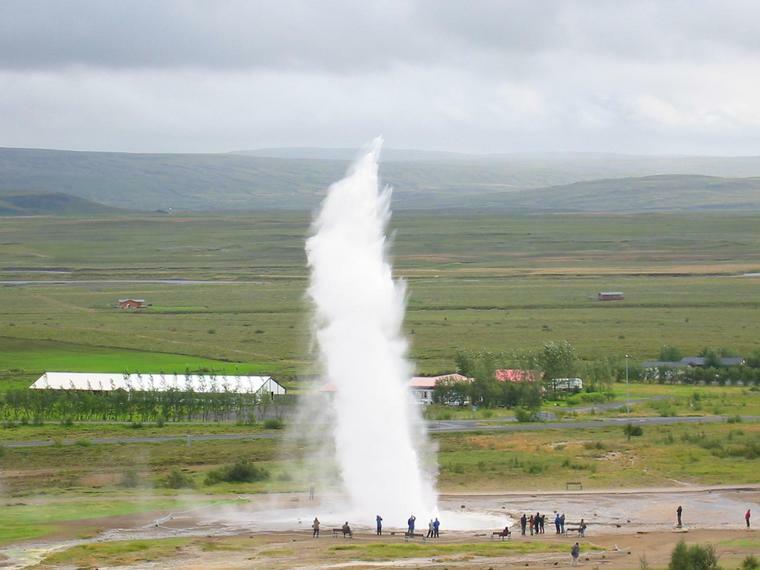 The first thing we did in the morning was go to the geothermal area again - it was too early for the tour buses, so it was just us and two other couples staking out Strokkur. 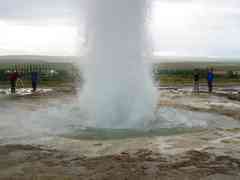 It was mesmerising watching Strokkur. 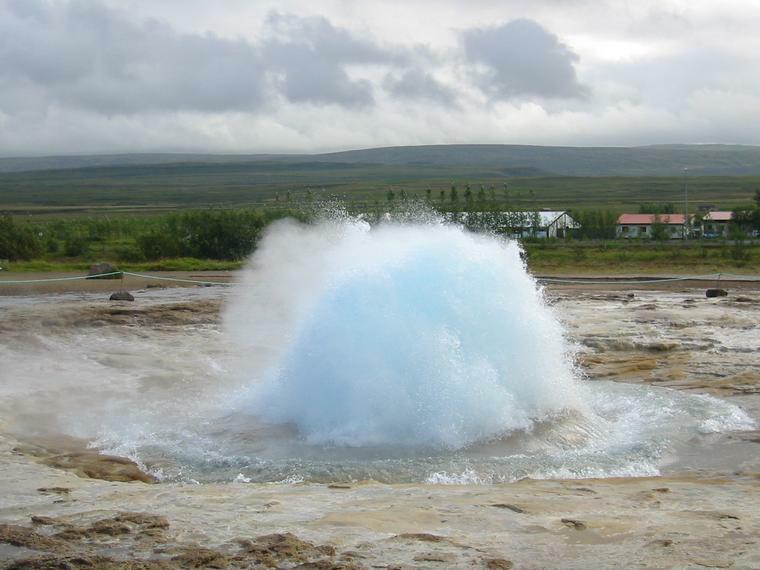 The seething water sloshes from side to side, overflowing the caldera a bit then retreating, then the blue bubble forms, and finally the steam blasts through that. 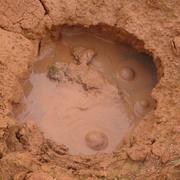 There are several smaller after-blasts, then a wait while the water flows back in. In addition to the big geysirs, the area has a good collection of fumaroles, bubbling mud, coloured pools, algae and mud encrusted flows, and so forth. 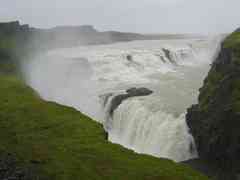 After breakfast we headed off to Gullfoss. This is spectacular - a huge waterfall in two stages, at nearly ninety degrees to one another - but it was hard to appreciate properly, or to photograph, in rain and strong wind. (If it had been dry it would be a lovely place just to sit and admire.) We stopped again at Geysir on the way back, where it was fortunately dry. Camilla tried to close the car door on me, but fortunately I had my whole arm in it, not just a finger, so I only got a bruise. 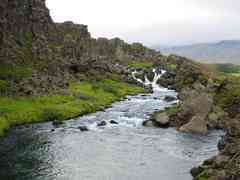 We took the direct route to Þingvellir, on the unsealed road. We stopped at the information centre to try to ring Anna and have a coffee. They had a good collection of books here, and I bought Works Along the Way. The historic area of Þingvellir is a lovely peaceful place - a green plain, through which the river Öxará flows into the lake Þingvallavatn, bordered by an escarpment rifted by ravines. There's a picturesque church, Þingvallakirkja, and the ruined "booths" of the goðar. We visited the Law Rock and had lunch by a small creek. We then wandered up to the viewpoint at the top of the main rift, where there's a new multi-media centre - not usually my kind of thing, but this one was nicely done. On the way back to car it started raining. As we were leaving we saw an encounter between two groups of geese (about seven in each). They ran at each other aggressively, and there was some to-ing and fro-ing before one group moved off up the hillside. Þingvellir would have been a lovely area to camp in and spend a few days exploring, if we'd had more time and the weather had been a bit better.